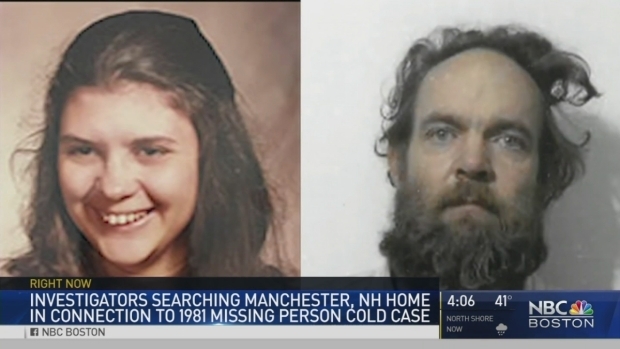 The case of a woman who disappeared in New Hampshire more than 35 years ago is connected to one involving four bodies found in steel drums in 1985 and 2000 in a state park, authorities said Wednesday. Those cases are also connected to a California murder case, authorities said, but they didn't provide more details. They've scheduled a news briefing for Thursday in Concord to release more information. Police recently searched a Manchester home where 23-year-old Denise Beaudin lived with her infant daughter and a boyfriend. Beaudin's family last saw her on Thanksgiving in 1981. When relatives went to visit a few days later, the couple and their daughter was gone. Her family assumed they left town to avoid financial troubles and never called police. The attorney general's office said it has been in touch with Beaudin's daughter and knows where her boyfriend, Robert "Bob" Evans, is. Authorities recently opened a criminal investigation into Beaudin's disappearance based on new information. Denise Beaudin was last seen in 181. Tuesday, investigators are searching the home where she lived with her boyfriend in Manchester, New Hampshire. Beaudin's father, Armand Beaudin, told NBC Boston the family is not sure they will ever have closure. "After 35 years, I ain't got much hope," he said. Armand Beaudin said he doesn't know if Evans is involved. In the case of the four bodies, investigators have used scientific testing to try to identify a woman and three girls found in the drums in a state park in Allenstown. In 1985, a hunter discovered the first two bodies - the woman and a girl believed to be 9 or 10. In 2000, an investigator found the other two girls - one believed to be 2 or 3 and the other 3 or 4. They believe the woman is likely the mother of the eldest and youngest girls. The time of their killings was narrowed to 1980 to 1984. The woman and eldest child show signs of blunt-force trauma. Investigators haven't released the cause of death for the two younger children.